Cognitive enhancers, commonly known as ‘Nootropics’ refers to supplements and drugs that have a beneficial effect on brain function. The popularity of cognitive enhancers has surged in recent times, perhaps due in-part to Hollywood blockbuster Limitless. While cognitive enhancers cannot offer the the superhuman effects experienced by Bradley Cooper from NZT-48, they can significantly improve various aspects of cognitive health, including executive functions (e.g. concentration, attention, alertness, etc), memory, learning and motivation. This month’s post will give you a breakdown of some of the most popular cognitive enhancing supplements on the market today. Known in Latin as Hericium Erinaceus, Lion’s Mane is an edible medicinal mushroom, native to North America, Europe and Asia, and can be identified by its long white strands and rounded shape. Lion’s Mane has recently seen an huge rise in popularity, which is unsurprising when you consider the mushrooms reported benefits including increased thought processing, elimination of brain fog, helping to protect against neurodegenerative disorders such as dementia and Parkinson’s, the ability to accelerate nerve damage recovery times and help combat mild cognitive impairment. There is a large body of research which supports many of the claimed benefits of LM however as the majority of these studies are in-vitro and animal-based , the extent to which these findings can be applied to humans is unclear. There is, however, an increasing number of human studies which have yielded very promising results. One such study was performed on thirty 50-80 year Japanese men and women with mild cognitive impairment . The subjects were divided into two groups, with one group taking a placebo and the other given Lion’s Mane. Over the course of the 16 weeks in which the Lion’s Mane was administered, the subjects were monitored for progress. At weeks 8, 12 and 16 of the trial, the participants showed significantly higher scores compared to the placebo group however when reassessed 4 weeks after termination of the study, the participants showed much lower scores, indicating that Lion’s Mane was effective in improving mild cognitive impairment. Rooted in Ayurdevic traditional medicine, the herb Bacopa Monnieri has been used for thousands of years for its cognitive properties, used by many to improve memory formation and speed of recall, enhance learning and enhance clarity of thought. Bacopa is one of the most well tested nootropics available on the market, in 2012 a review of 6 trials on BM concluded that there was “evidence to suggest that Bacopa enhances memory free recall in nondemented subjects” , in other words, when taken by healthy individuals, BM was shown to improve participant’s recall of listed names/items. Further studies confirms the positive effects of BM such as a piece of research comparing the cognitive effect of herbal supplements to indicated that there was robust evidence for improving memory performance, including positive effects on learning, delayed recall, visual retention of information and total memory . 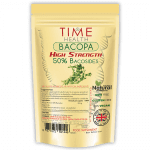 With this research in mind, Time Health offer a high strength Bacopa supplement containing 50% Bacosides (the active ingredients in BM) for maximum benefit. Cordyceps is the name given to a genus of mushrooms with around 400 individual species including Cordyceps Militaris and Cordyceps Sinensis. Cordyceps is commonly referred to as “the performance mushroom” for its applications in sport, having been shown to increase oxygen levels and reduce fatigue, and evening being linked to the record-breaking Chinese athletes in 1993. While, like Lion’s Mane, research into the cognitive benefits of Cordyceps is somewhat limited, there have been a number of animal studies which have shown encouraging results and indicate a need for further research. A study published in the Saudi Journal of Biological Sciences details how the bioactivity of the Cordyceps Militaris protected delayed neuronal death in the hippocampus in rats . This finding that suggests CM may be have potential benefits for the neuroprotection, however this will remain unclear until further studies are conducted on humans.